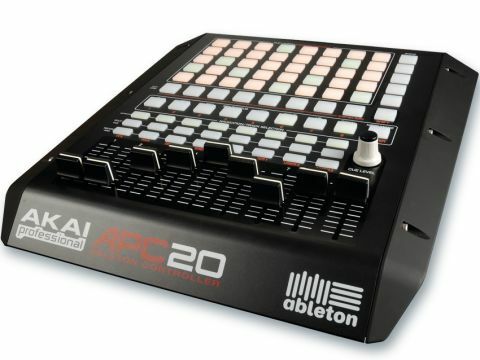 The APC20 is a seriously useful Live controller. But if you need more, spring for the 40 instead. Effective control of Live's Session View. More portable (and bargain-priced) than the full-size APC40. New Notes mode. The Shift button system for multiple functions isn't totally satisfactory. Not USB powered. Akai's APC40, released last year, was the first 'official' Ableton Live controller, which gave it the right to carry the Ableton logo, and to offer a level of out-of-the box control that other MIDI gadgets could only dream of. The APC40 was well-designed, well-built, and easy to use - though there was a feeling that it was somewhat chunksome for live gigs. 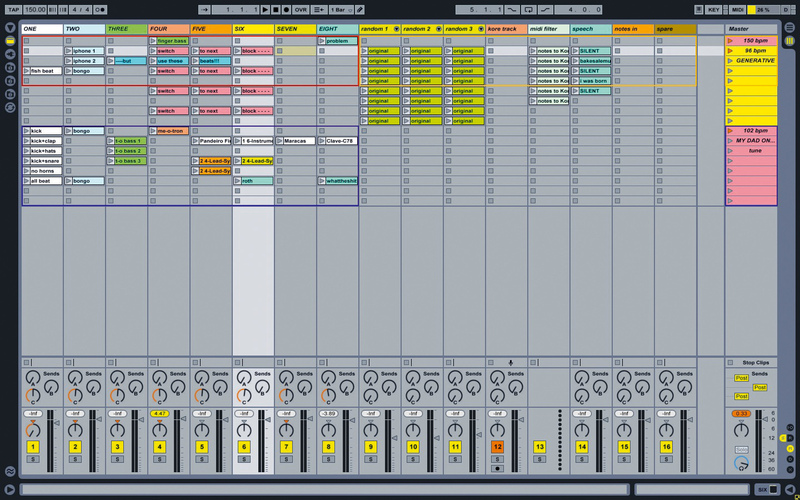 Novation (not coincidentally, Ableton's UK distributors) retaliated with the Launchpad, a cheaper, smaller, USB-bus powered unit which gave the bare bones of Live Session View control, with the benefit of compatibility with other music apps through the Automap software. Now, instead of coming out with something 'new', Akai has adapted the APC40, virtually cutting it in half and apparently shedding some of the functionality. Enter the APC20. Retaining the metal base and ABS plastic upper casing of the APC40, the first things you notice about the APC20 are things that are missing - like all of the buttons and knobs on the right-hand side, and the two footswitch inputs. That said, the nine faders, 40 clip buttons, scene select buttons and track buttons for activation, solo/cue and record arm remain from the 40. In an attempt to compensate for the lost physical controls, the APC20 has a Shift button, which gives dual functions to many of the other buttons and, critically, to the eight channel faders. But the thing that'll get existing APC40 users going is the new Note Mode button. Now the clip launch buttons can send notes directly to slots in Live Drum Racks (the Launchpad does this too). The Note Mode button also toggles the Track Selection buttons for transport functions, MIDI Overdub and grid navigation. he box includes Ableton Live Akai Professional APC Edition so you can start to jam immediately and the 20 is physically as close to the 40 as possible. It's the same height and depth, and logically uses the same parts and materials. The smaller size means this is a lot easier to find room for than the APC40 in a studio or a DJ booth. "In an attempt to compensate for the lost physical controls, the APC20 has a Shift button, which gives dual functions to many of the other buttons and to the eight channel faders." Some folks will be disappointed that mains power is still required, considering that Novation has managed to get the Launchpad running over USB - we're guessing that a move over to bus powering would require a major overhaul, and that effort would have been reflected in the price. Plug the APC20 into the mains, turn it on, hook up the USB cable, launch Live, select it as a control surface in Live's MIDI Preferences and the familiar red Session View rectangle appears. For APC40 users - because they're so alike, it's easy to load a Live set that you built for the 40 and use it straight away - this might make you think that you can use the 40 in the studio and the 20 as your takeout version. And why not? The APC20 looks and feels like the APC40. It works the same with Live, as far as clip/scene launching and grid navigation go. It also works with Max For Live in the same way. The Shift button feels like what it is: a workaround to retain the APC40's control functions with less buttons. Inescapable, we guess, but we struggled with the multi-function faders. You assign these by holding Shift, then pressing one of the Record Arm/Fader Mode buttons, to select Volume, Pan, Send 1, Send 2, Send 3, User 1, User 2, or User 3. So far so fair enough, but the Mode buttons don't stay lit to remind you of your selection, and it feels unnatural to switch from making a volume fade to a send effect for the same track. It works, and if you're not ducking and diving between sends and pans it's fine, but it's kludgy at best. Ableton was very involved with the format of the original APC40 and we wonder how it feels about these design compromises? Still, at least the APC20 has faders, and they are solid and great for levels. When you connect an APC20 and an APC40 to your computer, launch Live, and select them in MIDI Preferences, you'll get two of those coloured rectangles on screen, surrounding the relevant Session View clips, and something quite awesome happens: the APC20 slaves to the APC40, so as you navigate the rectangle around the Session View, both devices change their focus across 16 tracks! This is an awesome feature, and really makes the APC20 work as an extension of the APC40. Akai really should make more of this in the APC20 promo material. We're waiting for the first 'APC60' photos to appear online, as somebody unscrews the end panels and joins 'em up! There are also no compatibility issues between the APCs and the Launchpad - add it, and it'll also get its own rectangle. Novation's Automap software lets the Launchpad do things the APCs don't, including sending keyboard commands and interacting with other music applications. When Akai or Novation talk about adding up to six of their controllers, that could be in any combination, so you could have four Launchpads, an APC20, and an APC40 for the setup of your dreams. Nice. Apart from the mode-related problems, the APC20 works just as well as the APC40. If you wanted a backpack-friendly, cheaper APC40 then this is it. Likewise, if you wanted a Launchpad with faders, this is it. But if you want a controller interface that lays everything out clearly in front of you, this isn't it and you're better off with an APC40. Try to get hands-on with the APC20 before you buy it. If you're cool with the Shift button and multifunction faders, then what's not to like?